I didn’t want to make the title too annoying. I’ll get right to it and let you know this salad is downright delightful. Not only does it have just 4 main ingredients + takes 10 mins to make (!!!). This is nutty, cozy, texture HEAVEN! All nestled inside a bowl. You start by preparing the dressing, which is my standard go-to vinaigrette. A combination of olive oil, lemon juice, a touch of sugar, and a pinch of salt & pepper is all it takes. And when you taste it, you’ll see why. 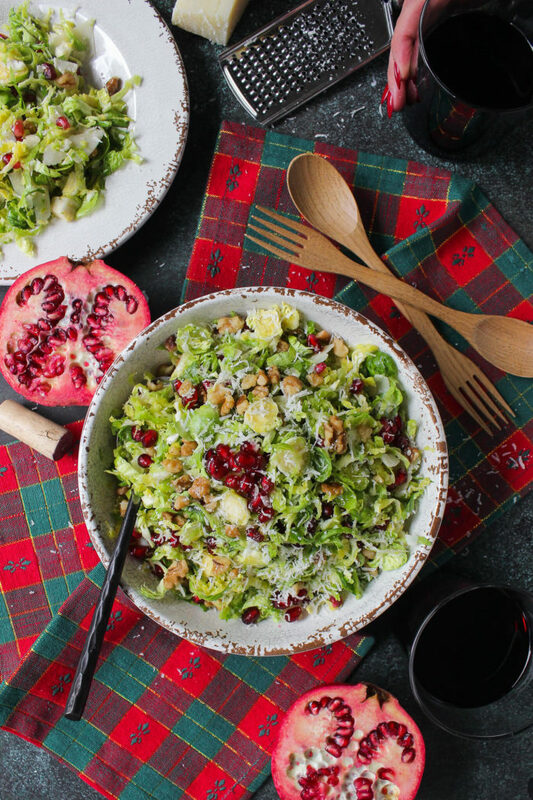 Savory, tangy, and just a touch sweet + peppery, it makes for one seriously balanced dressing. This literally goes with anything, so I say always keep it in your back pocket. But on this salad, it specifically lightens up the nut-heavy flavors with a needed splash of acidity! It’s refreshing, but not too much. Because comfort it still what we’re going for. 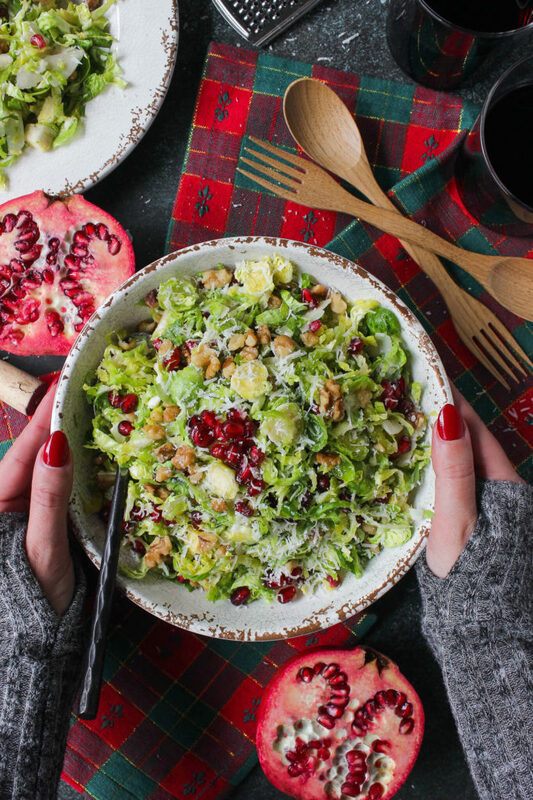 With the dressing prepped, on a cutting board slice the brussels sprouts thin so they have a shredded appearance, discarding of the knobby ends. Next toss with pecorino cheese, pomegranate seeds, and walnuts, then dress! So simple, yet so sophisticated to present. 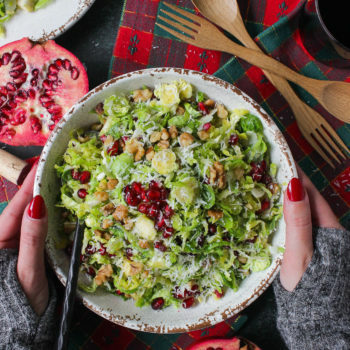 The dominant nutty notes of the brussels sprouts, pecorino, and walnuts are tempered by the sweet pomegranate seeds and tangy dressing to insanely satisfying results. It’s a lot of taste for something so streamlined, which makes me love it even more. This is perfect for a light winter lunch (throw an egg on it! ), appetizer, or side dish! Begin by preparing the dressing. In a small mixing bowl combine the olive oil, lemon juice, and sugar, whisking until combine. Salt & pepper to taste. On a cutting board slice the brussels sprouts thin, discarding of the knobby ends. 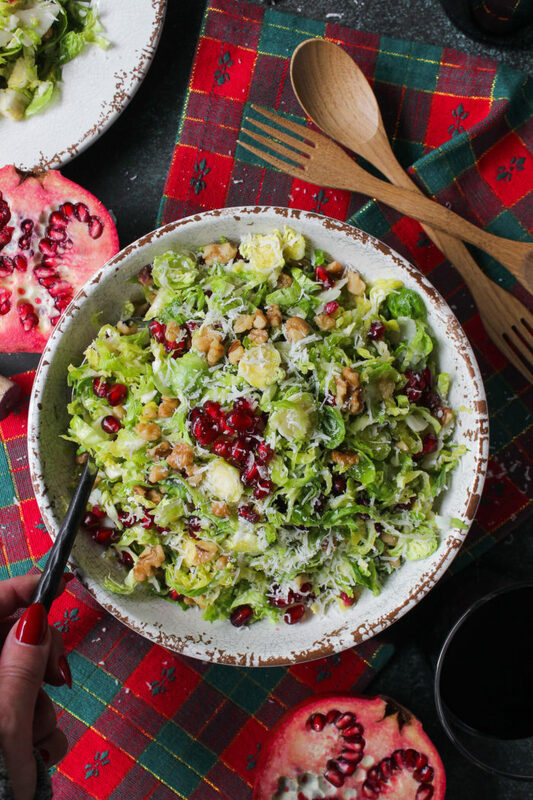 Transfer to a large mixing bowl, and combine with the pecorino cheese, walnuts, and pomegranate seeds. Dress the salad, tossing gently to coat. As a word of advice, I never use all the salad dressing at once — you can always add more, but you can’t take it out! Once you’re satisfied, serve and enjoy.